If you want to add distortion and/or sub-octave effects, check this out. Sounds excellent. Plenty of control. Valve-like warmth. 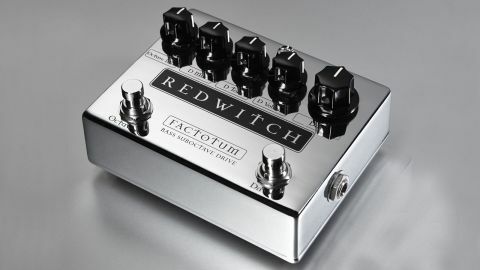 Much loved by guitarists, Red Witch has at last released an effects pedal aimed at bass players. Continuing the company's blend of art and technology into its products, this analogue unit is presented in a bright chrome finish and, as the name suggests, the Factotum has the dual function of introducing a sub-octave note and distortion. "With full blending abilities available, the combined sounds are high- quality and never seem thin"
Naturally, these can be used individually or together from independent switches, but of the five on-board rotary controls, four are concerned with the drive section and the other is used to blend the sub-octave into your regular note. Sonically, this is a joy from start to finish, as both functions are extremely effective in their own right. Analogue sub-octave is by no means an easy feat to achieve, yet this does the job with authority - and the single control proves more than enough to achieve a good ratio of wet-to-dry signal. The drive section is far more sophisticated: whether used in moderation or for full-on Armageddon, there's plenty of control and a natural valve-like warmth to the sound, that makes you want to use it more and more. With full blending abilities available, the combined sounds are high- quality and never seem thin. The Factotum is an extremely roadworthy unit with two great sounds that will appeal to most bass players. Red Witch has chosen a great way to start - let's hope more bass pedals are in the cauldron.